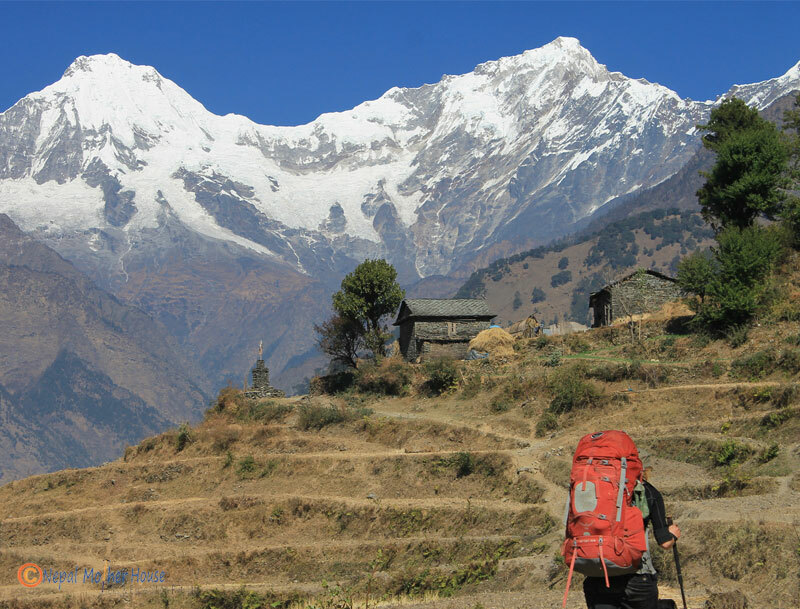 Trekking in Ganesh Himal is considered as one of the unique trek as a very few people prefer to trek in this region. The name Ganesh Himal is named after the God Ganesh who is an elephant headed God of Hindu. We can even see Ganesh Himal from Kathmandu valley and it lies between the valley of Budi Gandaki in the west and Bhote Koshi in the east. The Ganesh Range Peaks (Ganesh I, Ganesh II, Ganesh III and Ganesh IV) together forms like a crystal and looks like a Himalayan Chain. You can experience different flora and fauna like berberis, primula, orchids and many varieties of ferns, the valley surrounded by yellow blossoms of double jasmine, Spanish oak, blue pine, rhododendron etc. The rhododendron in spring season sets the village with rays of color which seems breathtakingly beautiful. One of the important characteristic of this trek is a crystal which you can find on the trek and is regarded as one of the precious stones. Ganesh Himal Trek also offers to see the lifestyle of Tamang people which is one of the ethnic groups of Nepal and their cultures as this trek passes through different Tamang villages. This is a first day of our trek and we start by driving to Samari Bhanjyang by a local bus which takes about 7 hours. On the way you can see the Trisuli Bazar which used to be the hub of this trekking along with local countryside, rice terraces, small gorges, green hills, etc. We stay overnight in Samri Bhanjyang which is a small town. We begin the day by walking the way somewhat plain and the trail goes uphill. We encounter different villages, forests full of pine and rhododendron, small rivers and countryside on the way. After following the route of flat land for about 5 hours we get to Katunje Bazaar from where you can have a first glance of Ganesh Himal. On this day, first the route goes downhill until we reach Lapang Besi. When we get here we trek along the bank of the river and get to see different traditional villages, farming terraces, fishing places, local countryside etc. We reach Kintang Phedi after trekking about five and a half hour where you can find few typical local houses, local shops and terraces for farming. The route slowly passes through different villages inhabited by Tamangs, Brahmins and Chhetris, farming areas and green hills. The main foods cultivated are millet, rice, maize, Wheat, buck wheat and green vegetables. After trekking about six hours you will get to Jharlang where you find one government school and several typical houses. The area you trek this day is like a ascent path and the route moves to the leveled path all the way to Chalise. It takes about six hours to get to Chalise and this area is quite developed than the area you visited previously as it has schools, health post, and chortens in this Tamang village. You will get to see many green hills, local countryside, and green rice fields on the way to Chalise. This day you will not get to see terraces as this area is ascent and flat. You follow the route of forests of rhododendron, and local vegetation where you can find various birds and wild animals. One of the good things to be seen would be local people grazing sheep and other domestic animals. Rajgang Kharka is all around surrounded by forests and it looks breathtakingly beautiful, we get to Rajgang Kharka after trekking about five and a half hours. It takes about six hours to get to Seto Kunda which means black and white pond. The path to the Seto Kunda is narrow and we have to walk up most of the time of the trek. For sometimes you walk through forests and finally walk through land where you will find no trees. Kalo Seto Kunda has two lakes one covered with black stones and the other one with white stones. These two lakes are considered holy and they freeze in the winter season. The area in Kalo Seto Kunda is known as Ganesh Himal Base Camp and you take one day to have an excursion around this place. You can explore around Kalo Seto Kunda and you can see Ganesh Himal, Paldor Himal etc from here. We trek back from Ganesh Himal Base Camp to Rajgang Kharka which takes about six hour. You follow descent and narrow path where you can find alpine grass on both sides to Rajgang Kharka. The trail moves all the way down to Chalise and you pass through forests everywhere, until you get to Hindung. It takes about six hours to get to Rajgang Kharka from Chalise. The interesting thing we find on this way is the pine forests along with Tamang Villages, farming areas, hilly parts and the green countryside. We trek all the way down for six hours to get to Laba Besi and Laba Besi is situated on the bank of Ankhu and Laba Khola. We continue our trek on this day through beautiful rhododendron and pine forests of wild animals and birds on this day. We walk up to Manyang Bhanjyang which takes about five hours. Manyang Bhanjyang is a ridge and this will be the perfect place for camping as it is surrounded by rhododendron and oak forests. You will pass Khading village on the way to Manyang Bhanjyang which is habited by Tamang and Gurung community. We again get to see the forests of rhododendron, oak, villages, and farming terraces while following the path descending steep for sometimes and afterwards downward to Majhgaun. If the weather supports you can have a glimpse of Manaslu range, Buddha peak and other mountains while trekking along the way to Majhgaun. Most of the people of Majhgaun are farmers but some of them also migrate to Kathmandu or other gulf countries for employment. Budathum is a village dominated by Newar community and it takes about 5 hours to reach Budathum from Majhgaun from where you can have a clear view of Manaslu. You again get to see villages, streams, and farming terraces on the way to Budathum which is a small town with old local markets. This is a last day of our trek and we walk descent way and straight forward for two hours to get to Arughat which is a local Bazaar. Most of the time we walk along the bank of Budhi Gandaki to get to Arughat and this place has accessible road along with schools, health posts, typical tea houses and is in the bank of Budhi Gandaki River. From Arughat we catch the local bus to get to Kathmandu and you can explore with green sceneries, rice terraces fields, vegetable fields, mountain views and countryside on the way to Kathmandu and stay overnight in a hotel in Kathmandu at the end of the day. We bid goodbye and take you to the airport for your further destination. Arrival and departure transportation, Kathmandu/Samri Bhanjyang /Budathum /Kathmandu by bus, 2 nights hotel accommodation in Kathmandu, in trekking food ( breakfast, lunch and dinner ) with accommodation , trekking permits, TIMS , guide, porters, their food, salary and insurance.